Balloons Material: Made of natural rubber latex, our balloons have passed EN71 quality certification, they are safe to be used for children. Wide Range of Applications: Latex balloons to use broadly and conveniently, it can be use for birthday, wedding, baby shower, filling with helium and water. Bigger Balloons: Elastic latex material, balloons don\'t explode easily (inflated). It is a perfect size for your any party decoration. 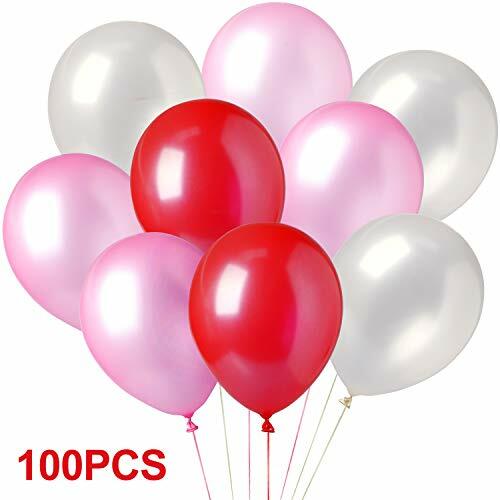 Colorful Choice: 100 premium quality balloons in the colors white, pink, and red, especially popular as wedding balloons or children\'s birthday balloons. Warranty and Service: We have 60-day money back and 12-month replacement warranty for all customers. If the balloon don\'t meet your need or any defect, please contact us and customer care team will response you within 24 hours.